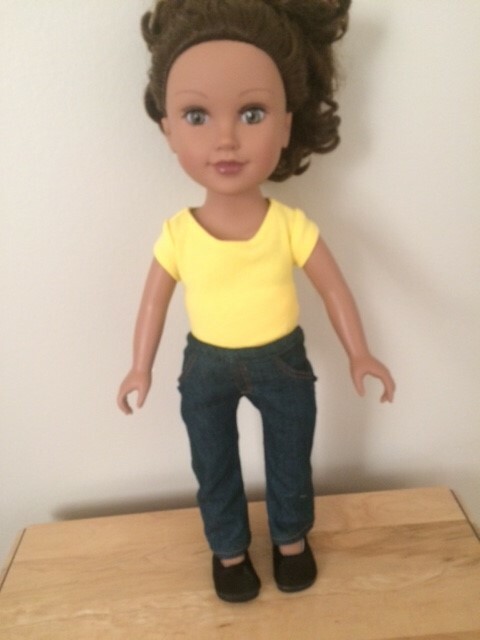 ﻿Everyone deserves a great fitting pair of jeans, even your Journey Girls doll! You’ll love how these cute jeans come out, and of course, if you use different fabrics and colors, you can make your doll a whole wardrobe full of choices. Design details include a slim easy fit, functional front and back pockets, top-stitched detail, and an elastic waist. This PDF pattern includes three styles: skinny jeans, mid-thigh length shorts, and shorter cut off shorts. Love this pattern. I cant wait to explore more things to make with this pattern . Im a beginner. Loved the pattern. very easy to follows. This pattern is easy to make, even for beginners like me. The details are amazing. I made the first pair in hunter green, light-weight, stretch denim, and love the results! I plan to make several more in other colors as well. Thank you Liberty Jane! I absolutely love these little jeans. 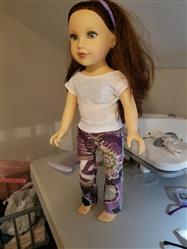 i enjoyed every part of sewing them and they fit the Journey doll so nicely.